Today's task was a 93 Km. 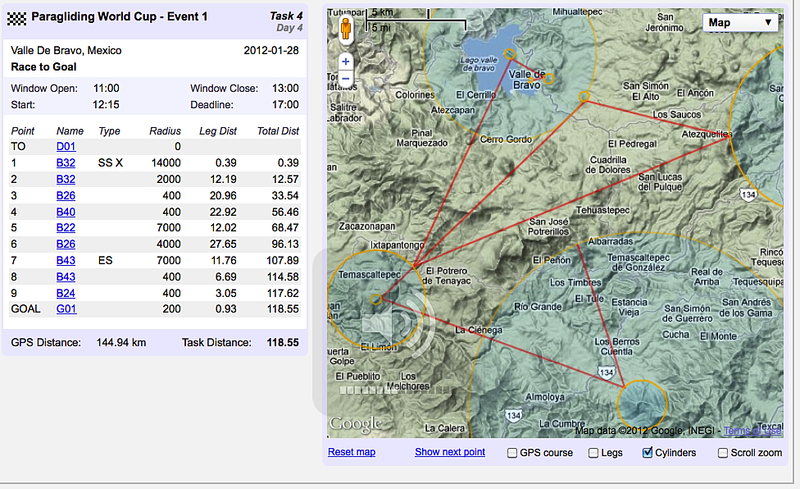 task that produced some good racing with climbs to 9000'. Josh was leading the pack much of the day. It all went wrong, for the lead gaggles, behind the mesa on the North side of launch. The leg between the 6th turnpoint and goal at the lake, just wasn't producing lift and the crowd dirted fairly quickly. 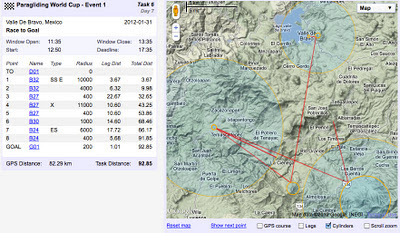 I was able to watch much of this task using Livetrack 24 and it was an exciting event. The application/server situation isn't perfect yet, but we're making progress. This task used an ingenious task method, in that turnpoints 3, 4, and 5 used the same fix. The pilots had to decide which direction to exit the 11k cylinder - then return to take the 400m cylinder before proceeding to the next turnpoint to the SE. The lead gaggles stayed together, but some tried to make up time by picking other vectors. 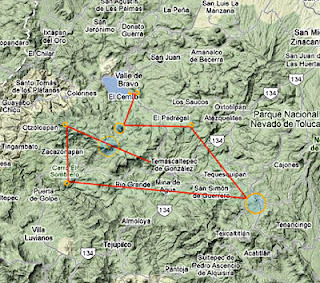 valle task 6 the flight from broers philippe on Vimeo. Today's results are HERE. 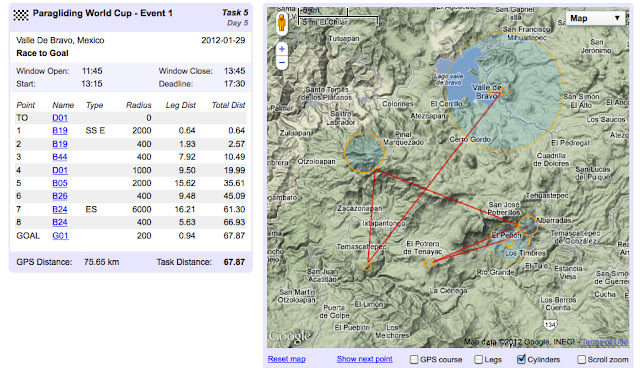 The task was a 916 point task with top-10 between 79Km and 76Km. Overall scores are below. Congrats to Josh Cohn and Jack Brown, who were in the hunt until it all went wrong for the gaggle. 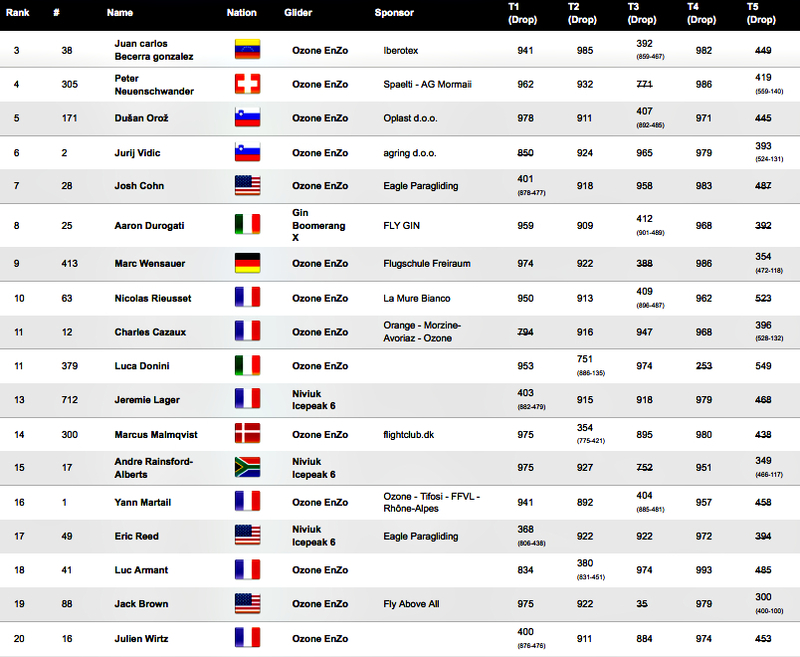 Nick Greece and Eric Reed also were flying well, placing 33 & 34th with 73Km. 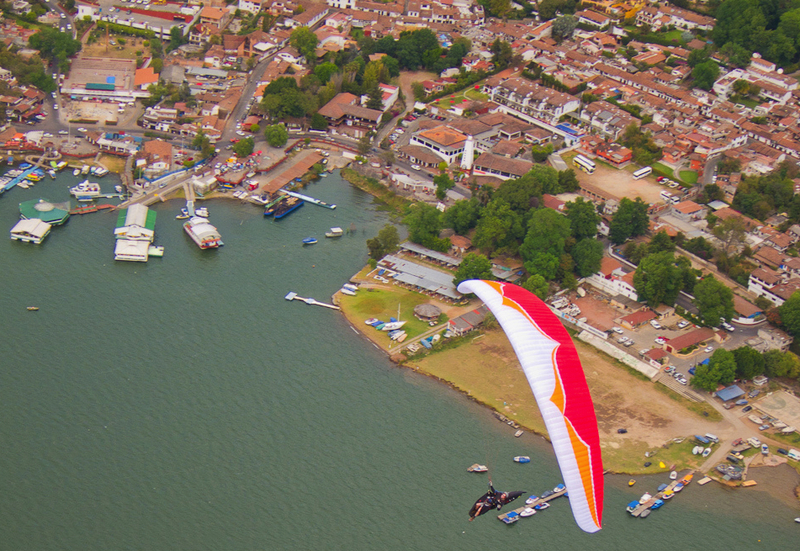 The 5th task of the PWC Superfinal was held under cloudy skies. An optimistic task of 68 Km. The start was very tentative and slow. It ended up being a sub-600 point day with only half the field exceeding 20 Km. This task will likely be the second discard of the meet, but conditions look weak tomorrow also. Late Edit: A rest day has been called for Jan 30th. 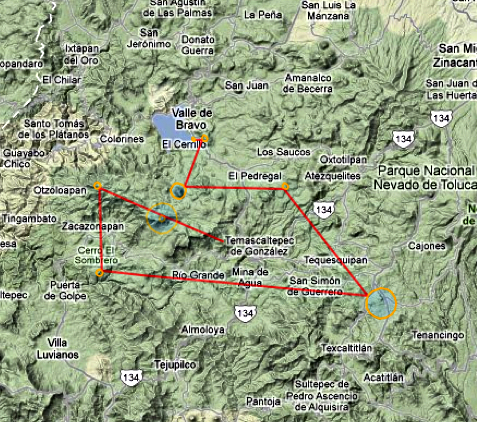 Today a 7-leg 120 Km. task was flown in strong, rough conditions. The pilots in the lead gaggle report that they were on full bar all day. The predictable did occur - there were many fully accelerated blow-ups but only 1 reserve toss. 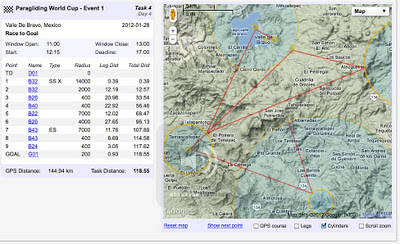 The lead gaggle, of over twenty gliders, crossed the ESS in 3:35-3:36 - averaging almost 30k/hr. Josh Cohn placed 4th for the day, with Jack Brown and Nick Greece in a tie for 8th place. Eric Reed placed 18th primarily due to lesser leading points. Brett Z. landed 7 Km. short of goal, placing 67th for the day. Overall rankings after 4 tasks (with one discard) has Jack Brown in 7th with Josh 1 point behind, in 8th. Eric is 15th and Nick is in 26th. The U.S. guys are making a great showing and there is still a lot of racing to come. Overall Ranking after 4 tasks with 1 discard. Click for larger view. 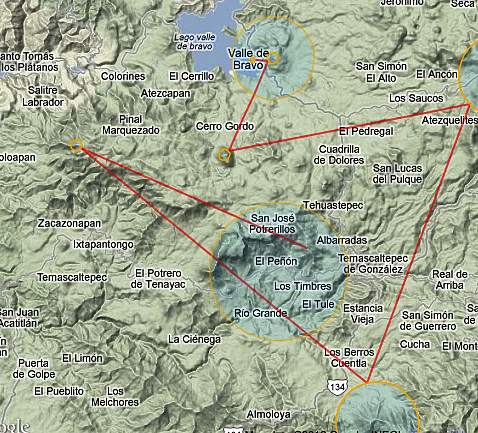 Valle de Bravo has been producing the consistent strong conditions that it is known for. This will require the pilots to maintain a high level of airmanship while fighting the insidious effects of fatigue. It appears that the major shift from uncertified gliders to EN-D gliders (the latest and greatest of which are effectively comp wings with less speed authority) has had little effect on the number of reserve tosses. Whether safety has actually been improved will be debated extensively following this comp. The task was a 103 Km. task with 7 legs and finished at the lake. 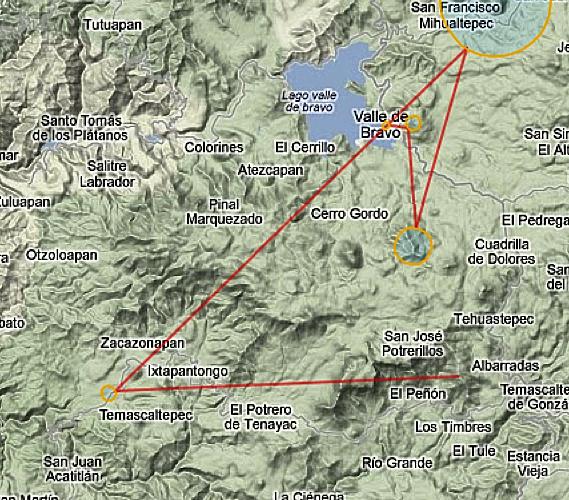 The ESS was close, and in the lee of Cerro Gordo - a dubious decision that put all finishing pilots only a 7Km. downwind glide to goal. Many pilots hit the ESS point at low altitutde, on speed and this was Nick Greece's undoing. 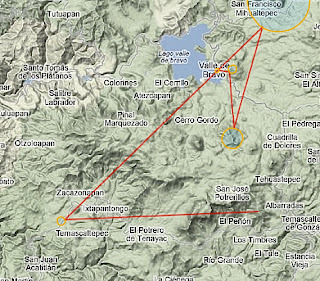 He had led the pack for 2 1/2 hours only to blow-up big at Cerro Gordo and come down under reserve. Jack Brown had some problems also in task 3. It appears, from interpreting the score sheet, that Jack jumped the start. He flew a great race, but was only rewarded with 35 points since he only got credit for the first segment to the start cylinder. Both Nick and Jack have flown well, and will drop 1 task in 4, so the day won't end their hopes to score well in the comp. Josh Cohn and Eric Reed flew very well, placing 7th and 12th respectively. Brett Z placed 72nd. Overall Josh is 9th, Eric is 18th, Jack and Nick are 47th and 48th - But a much more accurate standing (due to the discard rule) will be seen after the 4th task. The second task of the Superfinal was a 6-leg 92 Km. task that had 4 of the U.S. pilots in the top-10 and arriving at the ESS within one minute of each other. This kind of grouping, in the top-10 of a competition of this caliber, shows the depth of talent possessed by our U.S. crew. Eric, Jack, Josh, and Nick scored within 5 points of each other - essentially a tie. This puts Jack Brown in 4th place overall behind Juan carlos Becerra gonzalez, Hans Bollinger, and Andre Rainsford-Alberts. Josh Cohn is in 16th, Nick Greece is in 19th, and Eric Reed is 29th overall. 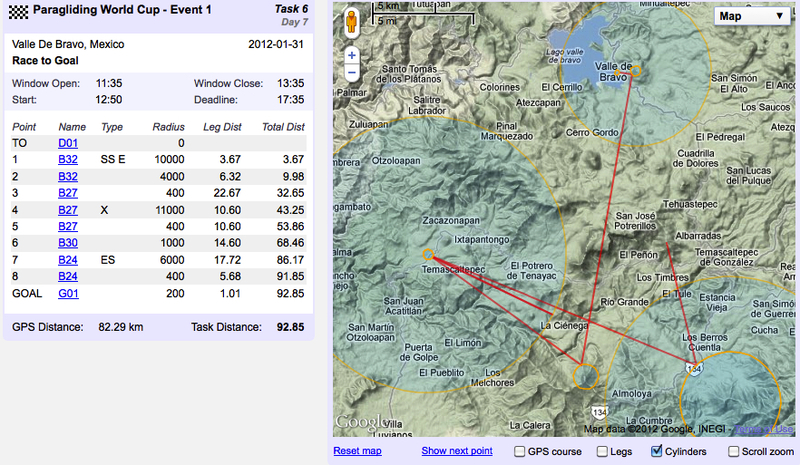 The first task of the 2012 PWC Superfinal was flown today in Valle de Bravo, Mexico. The task was a 4 leg task of 62 Km. with goal at the lake. I, like many pilots, hoped the Live Tracking would provide a clear picture of the race in real-time. Unfortunately this was not to be. Many of the favorites (and eventual top 20 finishers) had no tracks plotted after the first 10 minutes in the air. The results are visible HERE and the scattering of EnZos, Boom Xs, and IP6s among the top ten seems to be fairly even so far. Congrats to Jack Brown who scored 6th today. 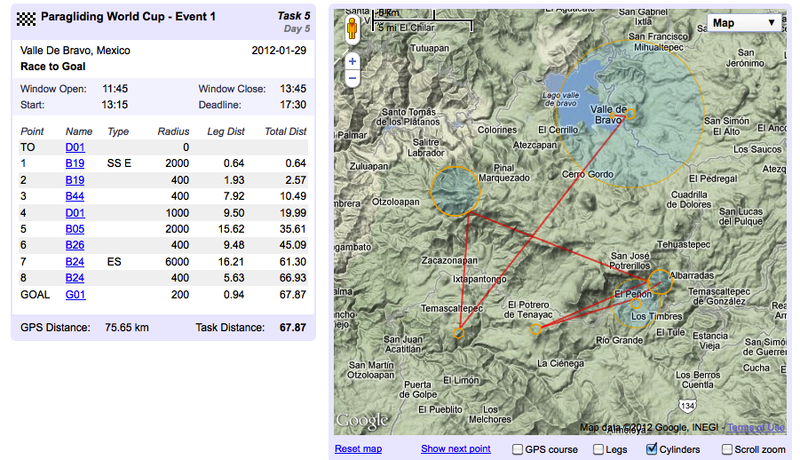 Today marks the first task of the 2011 PWC Superfinal in Valle de Bravo, Mexico. 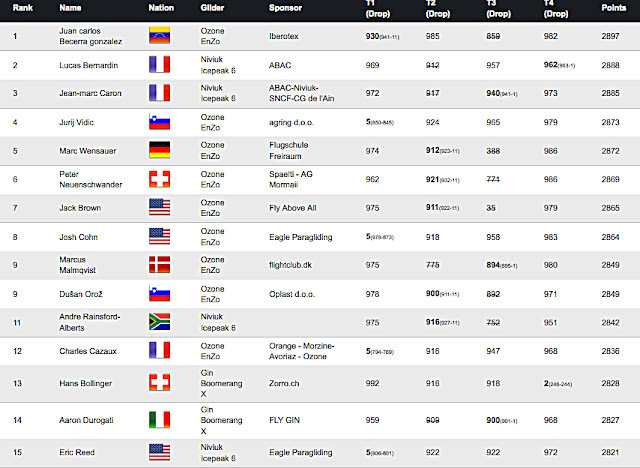 The U.S. has 5 pilots in the competition - Jack Brown, Eric Reed, Josh Cohn, Nick Greece, and Brett Zaenglein. 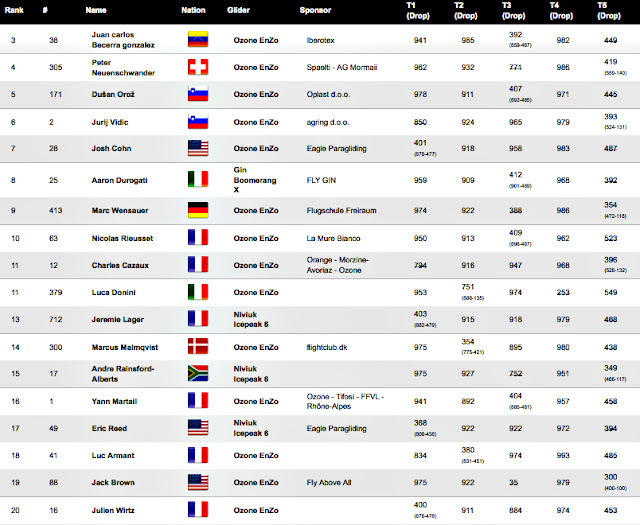 Eric and Brett are (according to the PWC website) flying Niviuk IP6s, and the rest are flying Ozone EnZos. These pilots are, arguably the best pilots in the U.S. and they are all flying the latest and greatest Certified, EN-D wings. 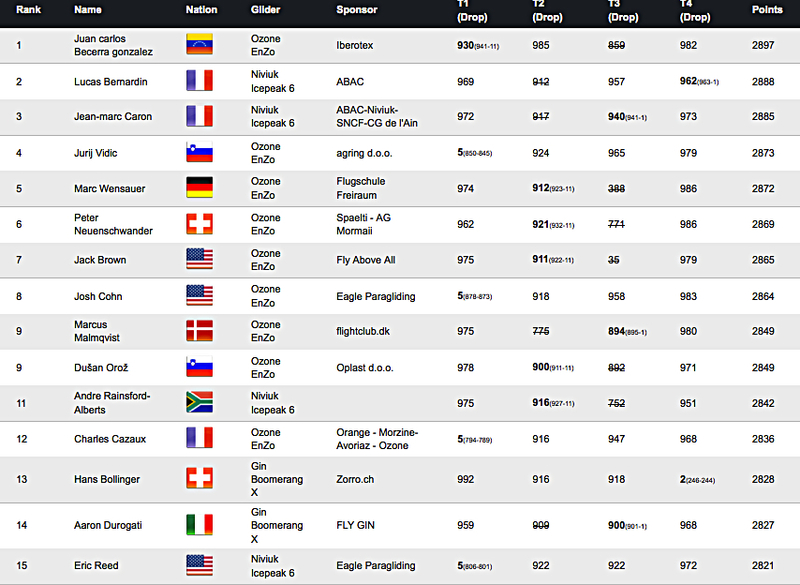 Conditions in VdB are forecast to be clear and good for XC tasks, so it should be a good test of the best pilots in the world. Good luck to all the pilots!